Rome's Italian character of the eighth century was evident in her irregular city-form that was born out of topographical makings and ancient rituals of town planning. What was most important to the Roman culture is the city's repertoire of institutional architecture, from its first expansionist phase to the creation of the Mediterranean empire under Augustus about the time of Christ, and the following three centuries of its dominion. Architecture was a civilizing mission and a sure means of establishing Roman visibility. The Romans appropriated the geometrical schemes of Greek and Etruscan colonies in various ways; one way was the Roman practice of locating new towns at the intersection between the north-south and east-west cross-axes, known as the cardo and decumanus, respectively. The practice of emphasizing this crossing was done by placing the Flavian Amphitheatre, now known as the Colosseum, along with other public buildings such as the forum-basilica complex, in the center of Rome. 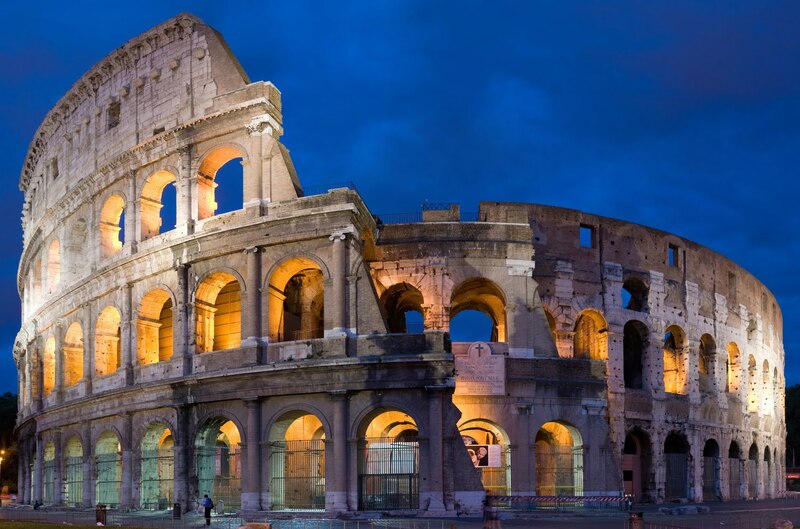 The Colosseum is the largest and first permanent amphitheatre ever built in the Roman Empire. 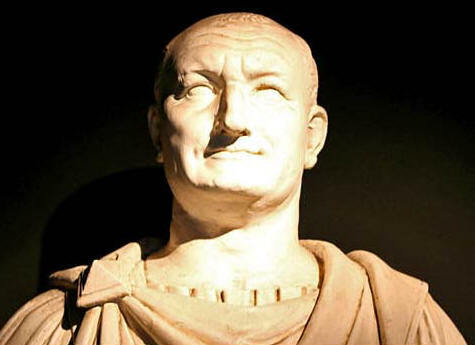 Its construction began in 70 AD under Emperor Vespasian, was completed in 80 AD under Titus, Vespasian’s older son, and changes were made to the building during the rule of Domitian, Vespasian’s younger son, in 81-96 AD. circumference of the top perimeter wall when rain or sun dawned on the spectators. eighty arches around its girth, the amphitheater swallowed more than 50,000 spectators that came to the games. entasis, the diameter of the columns would look narrower at the top if one was to peer upward at them. As spectators approached the amphitheater across a precinct formed with lava and then a smooth pavement bounded by stones, above them would tower the clear exterior of the building brightened with statues standing in the arches between the columns of the arches. Each of the seventy-six entrances was numbered to correspond with the admittance tickets. However, four other entrances remained unnumbered; two for the Emperor’s entourage; two for the gladiators, through one of which, the Porta Sanivivaria, the survivors returned and through the other, named after Libitina, the goddess of death, the corpses of the defeated were taken out. Gladiatorial combats had lost most of their religious and sacrificial significance adopted from the Etruscans and had become part of a system in which authorities appeased the people of Rome. A large proportion of the people were unemployed, and providing them with regular entertainment as well as with free distributions of food gave them some satisfaction in their impoverished lives. With Vespasian’s decision to replace the lake in the private gardens of Nero’s Golden House with the Flavian Amphitheatre, imperial land then became land for public use. This building was a place of entertainment intended to lift the spirits of the people during Rome’s restoration period and helped to maintain the beauty of the empire. The Roman people developed a sense of pride when they attended the events held in the arena. People of all statuses were united in a building where they could enjoy similar experiences. However, seating was strictly according to social class, meaning that the closer one was to the central arena, the higher one’s rank in society was. The emperor and Vestal Virgins occupied boxes at the most central points of the stadium, while the senators would sit at the same level, but at the ends of the stadium. Next up were the noble men and knights; then the wealthy citizens; then the poorer plebeians, slaves, and women. Although people were divided depending on their status, the building represented a hub for all people to congregate. It was a place that hosted entertainment games termed ludi, which were held in conjunction with Roman religious festivals, and were presented as part of the cult of the state. The Flavian amphitheater became the first permanent place where gladiatorial games could be held so that they no longer had to resort to the smaller, temporary squares set up in the Forum Romanum. Gladiatorial games were a sport of glory for those who survived, but all participants in the games knew that they walked along a very thin line between life and death. The gladiator’s oath by Petronius states, "He vows to endure to be burned, to be bound, to be beaten, and to be killed by the sword." Those who survived combat became wealthy public celebrities, but those who die are left without a memory. Gladiatorial games provided their sponsors with effective self-promotion while offering cheap, extravagant shows for their audiences. Gladiators strengthened the businesses of trainers and owners, and of starting politicians as well as experienced ones who were already high in status. It was very effective for politicians to win votes from plebians and their tribunes with spectacular shows during election season. Building the arena was a large political move during the time; it was intended to make the people seem closer to their emperor, as he would often be seen enjoying the games along with them. Some would argue that it was more intended to distract the public from the city’s ruins left from Nero’s despotic rule. Nevertheless, the construction of the amphitheatre proved a great way to make the people feel more part of a whole community. For centuries the Colosseum remained Rome’s most celebrated ancient monument as well as a source of supply for the building of other structures. The Ponte Sisto and the Palazzo Venezia were two of the buildings for which it provided materials. It is also an exciting place for botanists, for it was listed with over 411 species that grew there by 1855.
pagan gods and goddesses of the Romans. They went into hiding because to refuse would mean torture and death. around the perimeter of the Colosseum. Some authors and historians do not have positive opinions concerning the values associated with the building. Journalist John Pearson called it, “an effective system of empire-wide mass anaesthesia” and blames it for having “drained away those activities making for movement, change, unrest or ambition in society”. He stated that it had “ritualized mass fantasies for the realities of politics, religion…and war.” That may be true, and is still a topic of discussion concerning society today. 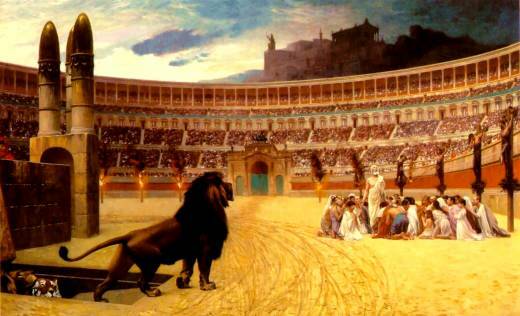 Are ancient gladiatorial games or modern day violent television shows good for the public? Are modern sports such as football and lacrosse that much different from gladiatorial games? The events allow the community to have a tighter bond, yet the question still remains if the act of community bonding is worth the potential bad influence it may have on their viewers. Learning about the good heart of Vespasian was an interesting part of my project that fueled my curiosity about his motives for building the Colosseum. He did not waste money but when there was something that needed doing, neither did he hoard it. In every province he spent money to build roads, provide public works, regulate boundaries and strengthen frontiers. He even granted taxation immunity to some deserving communities. In Italy he undertook a program of building and repair of civil war damage; even before his arrival in Rome the rebuilding of the Capitoline temple had been begun in token of Rome's resurgence. Schools were built and endowed, and a new life for the Empire was beginning. In the new order, the Emperor’s theme would be public service instead of a willful self-indulgence. The amphitheater can only agree with his intention in this respect. The Colosseum ultimately represented something that was not intended at the start of construction. The unification that resulted from watching violent games and religious ceremonies is something we still have today. Surely, Vespasian did not plan for this building to be influencing the lives of people in the 21st century. People today still have religion to feel connected with others and with God; modern reality shows are also a great example of a form of violence that the majority of the public like to watch on a regular basis. 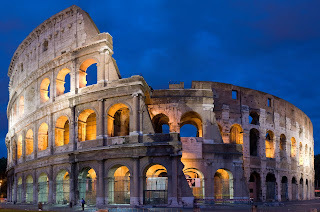 However, unlike television shows that eventually die out after a few years, the Colosseum is an important monument with such memorable characters that it has managed to remain influential and prominent to people all throughout the world over thousands of years. There is no place like Rome – famous for its more than 2000 years of history. Purchase your Colosseum tickets, your tickets to the Sistine Chapel and the Vatican Museums with us.